This piece was written over a year ago,and i am dedicating it to JJ on his birthday: WHY RAWLINGS SHOULDN’T KEEP QUIET Wonders, they say, shall never end. Yes, wonders shall never end. Do you remember the period between 2001 and 2008 when the NPP was in power? When JJ was the unofficial spokesperson for the opposition NDC? 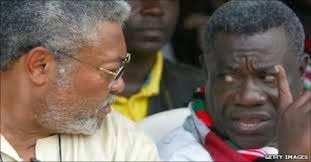 Do you remember that between 2001 and 2008, the NDC kept telling us JJ was someone who always spoke his mind? Do you also remember some prominent members of the party would even go on air to explain what JJ meant by what came to be known as ‘boom speeches’? Ok, what has changed? What at all has changed so soon that the NDC now finds it unacceptable that the man is doing what they have always admired him for? Is it because the NDC is now in power? Has JJ suddenly ceased to be someone who doesn’t speak his mind? You see, the Holy Book admonishes us “judge not, that ye be judged, for with whatever measure you….” Yes, in Fante, this Biblical admonition is expressed as “abaa a wodze bo Takyi no, wodze bebo Baah dabi”. Yes, so the JJ who spoke his mind to Kuffour, is the same JJ speaking his mind to Mills. Simple! But seriously, looking at the party NDC, JJ is someone who can effectively speak his mind at this time, without fear or favour. 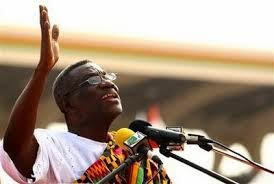 Yes, he is the man who founded the party, and reserves every right to ensure that his party remains as strong as he wishes, that his party delivers to the good people of Ghana, who voted out the corrupt NPP and voted in the NDC. At least JJ has tasted life as an ex-President under the NPP, and is the best person to know how it feels like. Remember when Kwabena Adjepong announced that all courtesies extended to him had been withdrawn simply because he has refused to shut up? Remember his cars were retrieved from him? All protocols were cancelled, and JJ, the all powerful man that he was, had to carry his own luggage to and from the airport? Yes, so if by his immense contribution, the NDC is back in power, why shouldn’t he ensure that it remains in power for as long as it takes, so that he too will feel comfortable and be duly recognized as an ex-President? Have we forgotten that ‘nea otwa sa no nnim se n’ekyi akyea’? So someone must tell Uncle Atta. The 1992 constitution of the Republic of Ghana ties the hands of the President, as far as certain vital positions are concerned. For instance, he cannot touch the Ombudsman, the Electoral Commissioner or the Chief Justice. This is understandable, in view of the vital roles these personalities play to ensure that our democracy is not a farce. They are supposed to be truly independent, and if the President can dismiss them at will, their neutrality and objectivity would be jeopardized. See? But this does not mean these persons cannot be changed for incompetence or misconduct. So ask me what the Chief Justice has done to warrant her dismissal? Remember in the heat of the election declaration, when defeated Akuffo Addo sought to use legal means to frustrate our young democracy? Yes, he sent Atta Akyea, the husband of the younger sister of the Chief Justice, to go and ask her to sit on a holiday, contrary to court procedures. Forget about the fact Atta Akyea is a lawyer, and that it was within his profession to stand as counsel for the suffocating Akuffo Addo. I hope you have not soon forgotten Atta Akyea’s involvement in the plot to thwart the will of the electorates in favour of his uncle Akuffo Addo? Just as was expected, the Chief Justice side-stepped the laid-down procedures of the judiciary and allowed the courts to sit on the matter on a holiday, even though the preconditions for such an emergency were not met. Again, not only was it wrong for the courts to sit on a holiday, but the case involved did not have to be an ex-parte motion. In fact, but for timely uninvited arrival of the NDC lawyers at the courts, our worse fears would have been confirmed, since it was obvious the courts were bent on upholding the ex-parte motion to place an injunction on the Electoral Commissioner from declaring Atta Mills the winner. We all know the kind of tension this situation woul d have brewed in Ghana. And to think the Chief Justice, appointed by the NPP administration, was openly biased against the NDC, don’t you think she compromised her position, by allowing the courts to sit on a holiday, and to allow an ex-parte to be filed against the EC and Uncle Atta? Also, remember when the issue of illegal acquisition of state lands came up? Yes remember the name of the Chief Justice came up as one of the beneficiaries? Now tell me, should the wrangling between the government and those who purchased the lands end up in court, how do you expect the Chief Justice to sit on top of the Judiciary whilst her case is pending in court? Don’t you think the judges, who are her subordinates, might be biased in her favour? 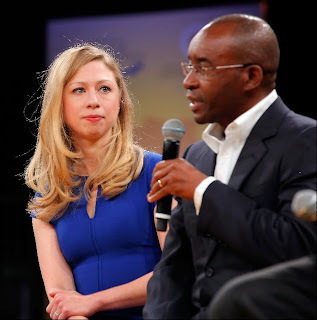 Last week, she exhibited yet again, another shameful bias against the Mills administration, when she and her outfit entertained a silly writ by stinking-mouth Kabila, a drunkard par excellence! Yes, she compromised her position, in a bid to help the NPP thwart Uncle Atta’s STX deal. That is the extent to which the CJ can go please political godfathers. You might wonder whether the CJ didn’t know it was wrong to obstruct the work of the august house, knowing very well that members were on the floor of the house, debating on the very issue the writ was about. You might also wonder what happened to the principle of separation powers! But that is Georgina Woode for you! Lastly, to think she was the Chairman of the commission that looked into the MV Benjamin cocaine case, two things come to mind. In the first place, she was not able to unravel the mystery behind the missing 77 parcels of cocaine. Second, she got it wrong when she penciled in some persons for prosecution, but who have had their sentences overturned. This goes to question her competence, as it is evident she contributed to the jailing of innocent persons, and how can such a person be the head of our justice system? Besides, with her involvement with the NPP and open bias against Uncle Atta in the heat of the election declaration, are you surprised the Attorney General has been losing all her cases? I hope Uncle Atta is listening. I shall be back! Working from home seems like everyone's dream - you're able to sit absolutely need environment, sip servings of tea, stay away from the commute and get watching TV and playing music every day. However concurrently for anybody who has actually experienced working at home it's clear until this is really something of the mixed blessing. Yes you are certain to get to work wherever that suits you and stay inside your pyjamas, truly doing this often allows you to feel somewhat cabin feverish, and as well it can add getting distracted by things such as on-line computer games and power naps. So what is the next step? Here we will make an effort to answer that question. “The most frequently cited statistic (regarding the effectiveness of diets) based on Judith Matz, LCSW, in her own article Recipe for Life, “is the fact that 95 percent of dieters will regain the lost pounds”. Personally and collectively, we all know reality of the. How many diets have we tried – and failed? How much money have we invested in frozen foods, supplements, books, programs, memberships, and equipment that promise to alter our bodies, to discover that weeks, months, or a couple of years later, we're right back where we started. And then we feel below par about ourselves. We interpret our “failure” as deficiency of perseverence or self-control. Yet again we've got still did not stick to the plan. Yet again our systems have betrayed us. What we do not realize is always that we've waged a battle between mind and body. Our minds are telling us that this diet will give us our bodies we wish. But our systems are fighting the intentional decrease of calories with an boost in the will to consume. In providing executive assessments and treatment strategies, (called “Corporate Coaching”) operate with the nineties, I have advised and consulted with executives during the entire United States and many countries worldwide. As you check this out article and feel this info may affect you, don't feel alone, you have good company! Many of my industry is of the highest caliber, talented people inside their companies. Work addiction syndrome is not a results of will power, lack of talent, education, morals or family values. In many instances, the executives impacted by this dysfunction usually are not even aware of the nature with the problem. What they are alert to, is the fact that life is not fun anymore, and they're being affected both at the job and also at home. The World Offshore Drilling Forecast has indicated that the amount of rig spending with the major exploration companies increase in the next 3 years. Drilling exploration alone is placed to raise by 7% and, as the industry discusses alternatives to offshore drilling in the wake in the Gulf of Mexico disaster, other strategies to extraction can also be being explored. All of this activity implies that you can find going to be much more oil and gas jobs at all levels readily available for candidates. In order to make no contact rule as effective as possible you must avoid every type of contact. That means you simply can't even relay a communication to your ex by way of a mutual friend. Don't question how your ex is if you're seeing someone who has constant exposure to them. You have to appear like you're continue, out of the broken relationship, right into a new life.